The group had come to rest that day in a clearing by a lake. After helping set up camp, Kali explored the edge of the water and found a large broad stone. It's surface warm from the sun beating down on it. It took no time at all for her to decide it was perfect as she climbed on top and stretched out in the sun. It wasn't too long after that the sound of shifting chain-mail and heavy boots drew her from her nap. "Hey, Kali..?" She opened an eye, turning her head to look at him, her ear flicking to single her attention. The viking shifted his weight as he towered over her, before continuing. "I have to ask. You live in the shadows, greet the night as if it were an old friend. What doctrine do you follow when your god is darkness?" He picked over the words, trying not to offend her. She pushed herself up into her elbows and cocked her head. "You want to know why I follow the Night Mother, but I don't commit terrible deeds?" Rawr! Here are my favorites!!!! Fear them, yeah! SqueekyTheBalletRat has started a donation pool! But also feel free to donate! I want to save up points now so I can have point prizes for future contests! 5 points extra overall for every additional character. Please send a note with your request and then pay here via donation. I will let you know when I have your picture ready so that you can pay. I won't ask for you to pay before I even start. Please to ensure the quality of the work, I ask that you do not request more than three characters per image. Send me a note with your request and email. I'm still working out my Paypal stuff, but if have another form of possible payment, let me know. Favourite style of art: Pretty much anything. 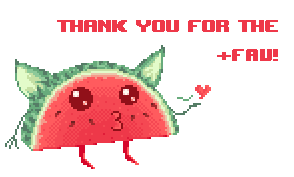 Personal Quote: "Tat tat tat..."
Thanks for the watch and the fav's! !